Are you looking for something different for your next corporate speaking event? Book me, Eric ‘the Birdman’ Dempsey, and discover what business strategies and life lessons we can learn from birds. I know birds. In fact, I am considered to be one of Ireland’s leading bird experts, have published eight books on Ireland’s birds and wildlife, am a regular voice on Irish radio and am one of the most sought after speakers on the subject. It is now known that birds, as we know them today, have been on the planet for over 45 million years. There are twice as many bird species are there are mammals on the planet today and they have developed successful strategies that have enabled them to conquer every part of the world from the hottest deserts to the Antarctic in winter. To put it another way, ‘Birds Ltd.’ is a very successful entity in this world and I’ve been studying it for as long as I can remember. In 2002, I even took the bold step to walk away from the corporate business world to follow my lifelong dream of being a professional in the world of nature. In this new strand of talks, I have developed a whole new thinking on what business strategies and life lessons we can learn from birds. We (humans) have moved so far away from nature, we sometimes lose sight of what we are trying to achieve and how we are doing it. Many birds undertake extraordinary life journeys and achieve greatness…it’s time that we took a step back and look at how and why birds are so successful. So, discover how you might ‘Fly High’ in business and in life, with these unique, insightful, informative and highly entertaining bird’s eye views on the world… the world as seen through the eyes of Eric ‘the Birdman’ Dempsey. I am that ideal ‘wild card’ for business conferences. 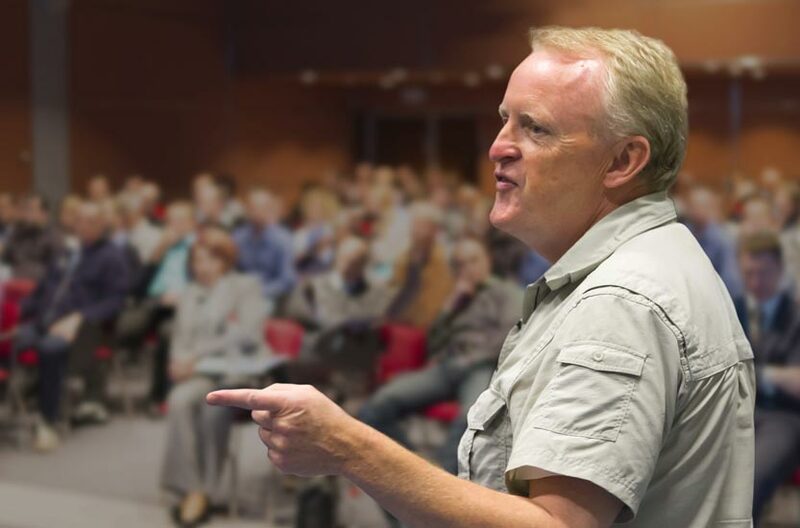 Eric, who is a recognised international expert on birds, brings to his audience unique business lessons which we business people can adopt from the survival instincts of birds. It’s amazing what we can learn from the strategies adopted by birds, as they position themselves for advantage. I am one of Ireland’s leading bird experts and team member of RTE’s Mooney Goes Wild show. I am the author of the best-selling ‘Finding Birds in Ireland’, ‘The Complete Field Guide to Ireland’s Birds’ and ‘Birdwatching in Ireland with Eric Dempsey’, while my latest book, ‘Don’t Die in Autumn – A Memoir’ has just been published to critical acclaim. Having worked in the corporate business world for many years, I left it to pursue my dream of being a professional in the world of nature. My full ‘Flying High’ presentation will last for 45 minutes, but this can be shortened according to requirements, time allocation and the event. This will greatly depend on the event, the location and the amount of allocated time. Prices start at €650 per presentation. Simply fill in the enquiry form below with the dates and description of the event. Once I receive this information and we agree the event and date(s), I will send you confirmation and an online payment link for an non-refundable 20% deposit (of the total agreed fee). The remaining non-refundable balance is required at least 7 days before the event. Take a look at how others have reacted to various talks I have given in the past. I have seen Eric speak and found his presentation very informative and attention grabbing. His unique link between Birds and Business is very thought-provoking and, unlike other presentations I have attended, it delivered the message strongly while being entertaining at the same time. I would thoroughly recommend Eric’s business presentation.